The quality of your IN and OUT store marketing is one of the keys to your effectiveness. Rely on POP Solutions to promote your brand or product to your target market. While adhering to your graphic charter, company codes and values. Thanks to its POP Factory division, POP Solutions takes control of your POS communications from start to finish: from design to production. All our products are made in our workshops in Belgium. We can therefore guarantee optimum quality control of all our products. 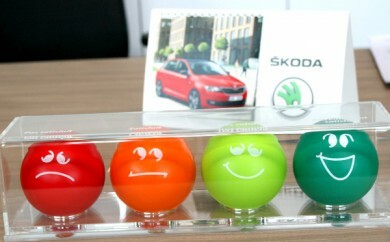 When the premium champagne brand Ruinart wanted a quality high-impact display, they turned to POP ..
An original customer satisfaction campaign for Skoda signed by POP Solutions. Discover it here! GOT A SIMPLE QUESTION OR WANT TO CHALLENGE US? Take advantage of POP Solutions’ highly specialised know-how and 360° approach to optimise your sales. Are you looking for a POS specialist? Optimise your point of sale marketing strategy. To optimise your sales our POP Communication specialists perform a thorough analysis of all the factors involved in the process, in relation to both retailers and shoppers. Our marketing strategy is defined as a global approach where nothing is left to chance. Give shape to your ideas. 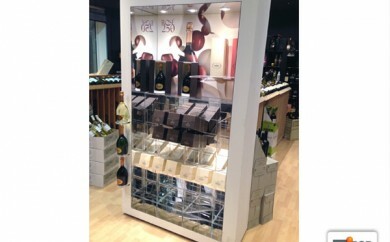 At POP Solutions we are proud of the experience, know-how and remarkable creativity of our display designers. Rely on POP Design to propose original, aesthetically pleasing and realistic ideas. Their ingenuity and inspiration know no bounds. Adopt your consumers’ point of view. POP Solutions’ expertise in terms of consumer behaviour and consumer management is a valuable asset in our competitive environment. Combining years of consumer behaviour experience with the latest advances in the subject, POP Solutions helps you to know your customers and future customers better, to anticipate their behaviour and to effectively manage your relationship with your customers.